Streptococcus pneumoniae is a Gram-positive, catalase-negative, encapsulated diplococcus that has remained an extremely important human bacterial pathogen since its initial recognition in the late 1800s. It commonly colonizes the human respiratory tract, particularly in winter and early spring. S. pneumoniae is a major cause of acute otitis media, pneumonia, bloodstream infections (bacteremia), and of a particularly virulent form of meningitis. The pneumococcus capsule consists of a complex polysaccharide that determines the serologic type and contributes to virulence and pathogenicity of this microorganism. Serotype 3 is one of the most common pneumococcal serotypes causing community-acquired bacterial meningitis in adults. Meningitis-associated intracranial complications (e.g., brain edema, hydrocephalus, ischemic infarction, and septic sinus or venous thrombosis) developed in 74.7% and systemic complications (e.g., septic shock, disseminated intravascular coagulation and adult respiratory distress syndrome) in 37.9% of cases. Rhabdomyolysis is a rare but serious complication that can be associated with pneumococcal meningitis. In this report, we present a case of pneumococcal meningitis complicated by rhabdomyolysis and acute renal failure, in a previously healthy young man. This case emphasizes the importance of monitoring creatine phosphokinase (CPK) level in patients with severe streptococcal infection for early detection of rhabdomyolysis, as it may lead to renal failure and other life-threatening rhabdomyolysis-related complications. A 46-year-old Indian man was brought to the emergency department by his roommate in an unconscious state. As described by the friend, the patient had had fever, headache, and myalgia for 4 days, for which he used paracetamol, but he had never sought for medical help. Before he was brought to the emergency department, the patient developed a witnessed generalized tonic–clonic seizure that resolved spontaneously after few minutes. His past medical history was unremarkable. On examination, the patient was drowsy, confused, and febrile. His blood pressure was 110/60 mm Hg, pulse 108/min, respiratory rate 22/min, and temperature 39.3°C. His pupils were reactive and his neck was stiff, but there were no focal neurological signs. The remaining of the examination was unremarkable. Blood investigations showed a hemoglobin level of 17.3 g/dL, a total leukocyte count of 20 000/mm 3 (91.7% neutrophils) and an adequate number of platelets, and an erythrocyte sedimentation rate of 55 mm/h. Serum CPK was 10874 U/L, blood urea nitrogen 11.2 mmol/L, serum creatinine 224 μmol/L, serum sodium 140 mmol/L and potassium 3.7 mmol/L, and serum myoglobin of 1185 ng/ml with significant myoglobinuria. Liver profile and coagulation studies were within normal limits. A malaria parasite smear was negative. Blood and urine samples send for cultures. Chest X-ray was normal. Lumbar puncture was performed. The opening pressure was 140 mm Hg, and the analysis of cerebrospinal fluid (CSF) revealed the following values: White blood cell count of 1500 cells/mm 3 (98% neutrophils), glucose level <0.1 mmol/L, and protein level 5.57 g/L. The patient was admitted to the Intensive Care Unit with a provisional diagnosis of acute meningitis complicated by rhabdomyolysis and acute renal failure. Early and aggressive hydration was initiated, and urinary output was measured hourly. Moreover, the patient was started on intravenous ceftriaxone and vancomycin while CSF culture was pending. The following additional studies were obtained after admission: Human immunodeficiency virus enzyme-linked immunosorbent and Widal test were negative. Two days later, the CSF culture yielded S. pneumoniae which was sensitive to ceftriaxone and penicillin G, whereas, blood and urine cultures were negative. Therefore, ceftriaxone continued for a total of 14 days. 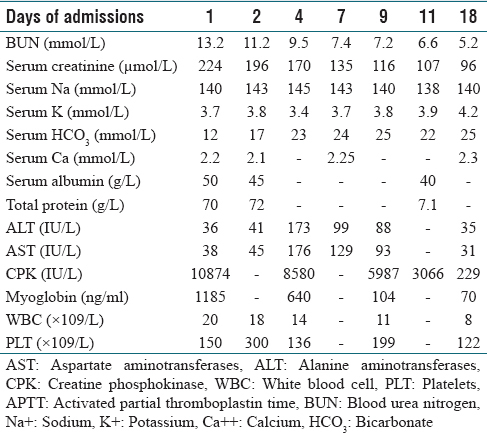 The patient maintained good urine output throughout the illness, and his renal parameters improved without dialysis as shown in [Table 1]. Eighteen days after admission, he was discharged without fever and with normal renal function and normal CPK level. Rhabdomyolysis is a syndrome involving the breakdown of skeletal muscle causing myoglobin and other intracellular proteins and electrolytes to leak into the circulation. Case reporting of S. pneumoniae associated rhabdomyolysis started mainly around 1982 since then nearly 22 cases were described in the literature. Moreover, rhabdomyolysis associated with pneumococcal meningitis is extremely rare. A MEDLINE search showed that only three cases of rhabdomyolysis associated with pneumococcal meningitis have been reported in the literature.,, [Table 2] details characteristics of some reported cases of rhabdomyolysis associated with pneumococcal meningitis. We think that the scarcity of the cases of rhabdomyolysis associated with pneumococcal meningitis is probably underreported because the clinical picture of rhabdomyolysis can be missed since muscular pain, passing tea-colored urine, swelling, and tenderness may not be prominent features and may even be absent. Manifestations of rhabdomyolysis may vary from subclinical to severe, depending on the extent and severity of muscle damage. Symptoms can range from mild myalgias to severe pain with weakness. Serum levels of CPK are a hallmark of rhabdomyolysis; a serum CPK activity greater than five times the normal value (in the absence of heart or brain diseases) is enough to establish the diagnosis of rhabdomyolysis. All these elements were present in our patient. In most cases of pneumococcal meningitis, major underlying conditions were identified: The most frequent predisposing or associated conditions include alcohol abuse, diabetes mellitus, splenectomy, and cancer or immunosuppressive therapy., None of these conditions was present in this patient. S. pneumoniae usually invades the meninges through the bloodstream. Bacteremia, present in 64.5% of the patients, can be either the primary event leading to the development of meningitis or a secondary event resulting from the clearance of bacteria from the subarachnoid space through the arachnoid villi to the bloodstream. A hematogenous pathogenesis seemed likely in asplenic patients, while contiguous spread from sinusitis or otitis was the major cause of meningitis in nonasplenic individuals. In our patient, blood culture was negative while CSF culture yielded S. pneumoniae. The mechanism(s) responsible for rhabdomyolysis with pneumococcal infection are poorly understood. Proposed mechanisms for infection-induced rhabdomyolysis include tissue hypoxia caused by sepsis, toxin release, direct bacterial invasion of muscle, low oxidative and glycolytic enzyme activity, and activation of lysosomal enzymes. The complications of rhabdomyolysis include hypovolemia, compartment syndrome, acute renal failure, arrhythmias, disseminated intravascular coagulation, and hepatic dysfunction. Acute renal failure develops in 33% of patients with rhabdomyolysis; it is the most serious complication in the days following the initial presentation. Despite highly effective antibiotic therapy and modern intensive care facilities, the mortality in adult patients with acute pneumococcal meningitis is 20%–30%. The treatment and prognosis of myoglobinuric renal failure associated with pneumococcal meningitis remain unclear, due to the paucity of cases. According to our review of reported cases, in addition to the current case, we think that the prognosis depends on the underlying conditions associated with pneumococcal meningitis. Treatment of rhabdomyolysis associated with pneumococcal meningitis requires appropriate antibiotic, aggressive volume replacement, careful monitoring of electrolytes and renal function, and hemodialysis if these conservative measures fail. Our patient responded dramatically to the antibiotics and aggressive volume replacement. Rhabdomyolysis is a rare but serious complication of pneumococcal meningitis that should be considered in any patient presenting with pneumococcal meningitis and unexplained acute renal failure. Therefore, frequent monitoring of CPK is helpful for early detection of rhabdomyolysis to prevent its life-threatening complications. Hausdorff WP, Feikin DR, Klugman KP. Epidemiological differences among pneumococcal serotypes. Lancet Infect Dis 2005;5:83-93. Koedel U, Scheld WM, Pfister HW. Pathogenesis and pathophysiology of pneumococcal meningitis. Lancet Infect Dis 2002;2:721-36.
van de Beek D, de Gans J, Spanjaard L, Weisfelt M, Reitsma JB, Vermeulen M. Clinical features and prognostic factors in adults with bacterial meningitis. N Engl J Med 2004;351:1849-59. Kastenbauer S, Pfister HW. Pneumococcal meningitis in adults: Spectrum of complications and prognostic factors in a series of 87 cases. Brain 2003;126(Pt 5):1015-25. Khan FY. Rhabdomyolysis: A review of the literature. Neth J Med 2009;67:272-83. Lane R, Phillips M. Rhabdomyolysis has many causes, including statins, and may be fatal. Br Med J 2003;327:115-6. Blanco JR, Zabalza M, Salcedo J, Echeverria L, García A, Vallejo M. Rhabdomyolysis of infectious and noninfectious causes. South Med J 2002;95:542-4. Chun CH, Raff MJ. Rhabdomyolysis associated with pneumococcal sepsis. Diagn Microbiol Infect Dis 1985;3:257-61. Bartalesi F, Borchi B, Grilli E, Corti G, Bartoloni A. Late-onset rhabdomyolysis in pneumococcal meningitis: A case report. Intern Emerg Med 2007;2:233-5. Hroncich ME, Rudinger AN. Rhabdomyolysis with pneumococcal pneumonia: A report of two cases. Am J Med 1989;86:467-8. Kragsbjerg P, Källman J, Olcén P. Pneumococcal meningitis in adults. Scand J Infect Dis 1994;26:659-66. Durand ML, Calderwood SB, Weber DJ, Miller SI, Southwick FS, Caviness VS Jr., et al. Acute bacterial meningitis in adults. A review of 493 episodes. N Engl J Med 1993;328:21-8.